One of the questions I get asked often when I discuss running Windows on my Mac is gaming. What kind of games can I play and how well do they run? When answered honestly, I say not well. There are games that you can play, and like most computers, the greater the hardware, the better the experience. With that being said, you are still running games within a virtual machine that sits ON TOP of the OS X operating system that is running directly off of your hardware. I know that’s quite the oversimplification, but the point I am trying to make is that the running Windows on your Mac for gaming purposes only is not advisable in this editor’s honest opinion. In this article, using both Parallels and Fusion, I attempted to play a handful of games. I started out by installing Steam and then downloading Age of Empires II HD, Half-Life 2 and to change things up a bit, GRID 2. Keep in mind that this is a somewhat older MacBook, a “Mid 2010” to be exact. The NVIDIA GT 330M and its 512MB of memory should be able to handle the games we chose to test with, but how they handle them within a VM is another thing altogether. Age of Empires II HD, remade to not look horrible at today’s resolutions, was the first game that we tested. After installing it on both the Parallels and Fusion VMs, I began a quick game against the AI. Running in full screen at my MacBook Pro’s default resolution of 1680×1050, the game was playable but nothing that got me overly excited. It wasn’t that the game got choppy in certain areas, it was just an overall lethargic feel to the gameplay as a whole. With a connected mouse, it is certainly playable but if my primary reason for running Windows within either of our virtualization apps was to play games, I would be far better served running Windows in Boot Camp instead. Both Parallels and Fusion handled AoE II HD the same way. Half-Life 2, personally my favorite game, in its heyday was a game that we used in our own benchmark tests, as well as its fantastic later Episodes 1 and 2. In our testing of the two virtualization platforms, I simply ran the original HL2. Again running in its native resolution, the game was practically unplayable. In Parallels we averaged 18 FPS and in Fusion, 16. Dropping the resolution down to 800×600, our experience was a little better. In Parallels we saw 26 FPS and in Fusion, 25. As I stated with AoE II HD, you are better off running Windows in Boot Camp, rather in virtualization. The last game we wanted to try out was GRID 2. Easily my favorite racing game on the PC, GRID 2 received positive marks from our own Rob Williams last summer. Like Half-Life 2, the only quasi respectable playing experience was done at 800×600 and with the detail dialed way down. This was not fun. I know this wasn’t a deep-dive into what we can expect from our Windows-as-a-VM gaming experience. I originally planned on doing something like this but after my experience with a far-from-demanding game like Age of Empires II HD, the decision was made to scrap the deep-dive into gaming on Windows running on both Parallels and Fusion. With that being said, this is also an older MacBook, so the blame of our poor game performance cannot be fairly blamed on the either of our virtualization products. I didn’t expect to be able to max out each game we tried, but having had considerable good fortune with playing games on this notebook when using Boot Camp, I honestly expected a little bit better of an experience than what we saw. What is there to say that hasn’t already been covered? These two products are by no means the only way to run Windows on your Mac. There are other virtualization offerings and Apple itself encourages its users to use Boot Camp when that Windows-only application comes a calling. But, in any discussion involving virtualization on the Mac, these ones looked at here deserve to be discussed before any other solution. Both have a great track record and with these latest two builds, bring even more to the table. 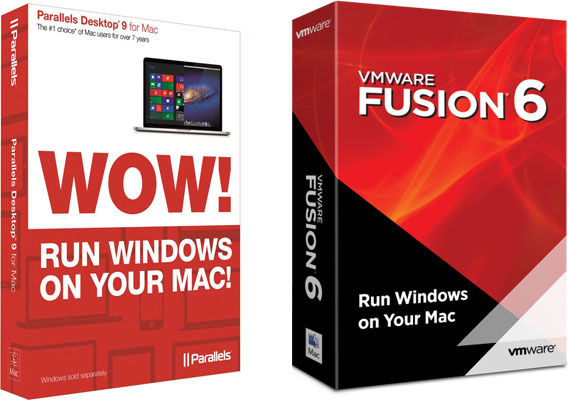 Parallels Desktop 9 has been the industry standard for as long as it’s been possible to virtualize Windows within OS X. The polish of the experience really came out in our testing. It worked seamlessly with Windows 8.1 and the company was on top of things when Mavericks was released. Integration with cloud storage eliminates the duplication of files on your Mac and the seamless addition of a Start menu within Windows 8 allows daily workflow to continue uninhibited. I have not used previous versions of Parallels, so I cannot comment on the performance improvement claims that have been made. However, the Internet is littered with stories confirming these improvements, so you are free to come to your own conclusion on that. VMware Fusion 6 was admittedly well within my comfort zone. That’s not to say that I was inefficient with Parallels Desktop or that it was cumbersome to use. What I mean is that the operation of Fusion 6 was no different than what I was used to in previous versions. Because of this, I can speak to performance gains with 6. Its stability and very deep compatibility with other operating systems are certainly something to take note of when speaking about the software. Fusion 6 is more of what I would call a power user’s virtualization platform. Meaning, the user is free to use almost any OS they can think of on their Mac. This is something that cannot be done on Parallels. This is also something that many users will not need. My take away from the past two months of testing is that both of the offerings that we’ve discussed in this review are superb solutions. They both allow the use of Windows applications on OS X by allowing a full install of the OS to run virtually. If I had to choose between the two, experience will win out and I would have to choose Fusion. However, I will continue to use Parallels because of its simple and easy to use design. For most of the people that I know however, if and when they ask for recommendations, I will likely point them towards Parallels. It’s supremely beginner friendly and truly integrates Windows and its programs into the OS X experience. Both are incredible solutions. It simply comes down to how you intend to use them. For users that require a Windows machine for whatever reason, perhaps to run a program or two, Parallels will be the simplest way to go. For power users that need the bells and whistles that come along with VMware Fusion, the choice is easy. Whatever you decide, you won’t make a wrong decision. Both are feature rich, stable, and optimized for Mavericks. Both will enable you to get your job done and for someone like me, running Windows alongside OS X has been a godsend.